With so many options on how to travel, guided tours remain the number one way to explore a country with ease while gaining incredible cultural insights. Let the organization and booking preparations be taken care of, without worrying about the day to day logistics escorted tours leave each individual with time to explore and absorb the magic of their surroundings. For over 25 years, Adventures Abroad has specialized in guided travel tours around the world. We currently lead tours to over 120 countries with 400 unique itineraries that include a range of activities for all types of fitness levels. 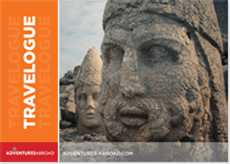 We visit both the world's most popular destinations such as Europe and take groups off the beaten path to the world's least visited destinations such as Nauru. Each tour day is designed to highlight the best each location has to offer, with guided tours of museums, historical sites, parks, and cities. Ample downtime is also included in the day to ensure an opportunity to reflect on the days events. Small group guided tours are at the core of how we design our trips. With a cap on 18 people per departure, our small groups sizes allow each member to speak with our expert tour leaders, retain the ability to hear our knowledgeable local guide, and also take in the sights without feeling crowded. Over the years, Adventures Abroad groups have consistently included wonderful people with a passion for travel, a curiosity for cultures, an adventurous spirit, and a desire to continue as lifelong learners discovering the many places found in this world. Whether you are travelling with family, a friend, or alone, our guided tours often form a family bond, allowing each member to share the in awe with new friends. Each evening, our groups gather in carefully chosen local restaurants to showcase the unique cuisine of each region. We've learned over the years that local food is a fundamental way of understanding the culture better, and by avoiding large buffets as well hotel restaurants, we allow the group to naturally immerse themselves into a fun evening out. When travelling with an escorted tour group, often it is easier to venture off the beaten path. Taking into account special events for each location, we have crafted and continue to update each itinerary with activities that will enrich the travel experience. Whether that includes seeing the major sites or gaining exclusive access to a hidden gem, all the details are carefully prepared by our office and managed seamlessly by our experienced tour leaders. No matter how remote the destination, how foreign the language, or how challenging the logistics, rest assured knowing that everything has been taken care of by travel professionals in the region. While travelling, what better way to gain an insight into the culture than by joining guided travel tours with knowledgeable local guides. By explaining historical events along with modern viewpoints, we work with locals who can talk about the topics that matter and leave each member of our groups feeling that they now know why each place we visit is important. From art to architecture, rural to urban areas, flora and fauna, our days are joined with experts that have a wide range of knowledge and with people who are eager to share their enthusiasm about their home. By having both a comprehensive look at your surroundings with a local guide and following a talented tour leader, days are maximized. We know time is a precious commodity, and our guided tours not only book accommodation in places that are well positioned to sightsee and are well reviewed to ensure quality, sometimes where we sleep becomes a destination in itself. Jungle camps, safari tents, oceanfront bungalows, and boutique hotels in city centres are just some of the places we stay in. Between each destination we take in private and local transportation, efficiently and safely allowing us to travel. Travel is never just about crossing off a check list of where one has been, our philosophy is to experience each place as authentically as one can. Whenever possible we visit festivals and celebrations unique to the area. Home visits and markets gain a better perspective of local life. Often we have unexpected interactions with locals who are just as curious of us as as we are of them. Beyond the in-depth talks of historical information, lessons on customs, and explanations of family life, we strive to allow each member of our group to go home with a natural and unstaged connection to the people of each place. For these are what memories of a lifetime are made of.